Swinton Primary School in Glasgow donates to Toybank! Toybank UK received an email in June 2010 from a school teacher Claire Rodger from Swinton Primary School in Glasgow. The school found out about Toybank through Slumdog Secret Millionaire aired on Jan 17th on Channel 4. Claire's students had worked hard to raise money for Toybank and they wanted to send it to us. A few days later our Toybank UK core team member Roshan was thrilled to receive a cheque of a £411.60 from the school! Here is the letter that the school authorities sent along with the donation. 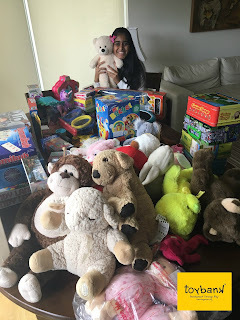 All of us at Toybank UK - Shruthi, Nilam, Ayushi, Roshan and Toybank India can't thank the children and the school enough for this wonderful donation! They have got the essence of the very idea that we are trying to make more and more people aware of, that it is more expensive to transport toys from the UK than the toys themselves; but it is so much easier to collect funds in UK and help Toybank further its cause! Toybank sincerely thanks all the students, teachers and all those involved in this truly generous contribution made by Swinton Primary school! Your support encourages us to reach out to more and more children. IBM and Toybank donate toys to CFTI! 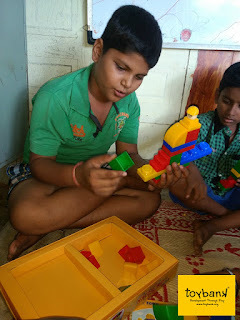 Toybank Bangalore ties up with Rentoys! December is here and so is the Party Time! Toybankers in UK go on air on Asian Star Radio! It's party time for Toybank UK at Baylis House! Toybank distributes toys to Excalibur Foundation!